Germany is one of the major countries of the European Union, and has borders with ten other European countries. Modern Germany is a federal republic, with 16 states or “Bundesländer”, and a federal government based in Berlin. It offers a wide variety of attractions to the visitor, from the landscapes of forest, lake and mountain, to fairytale castles and bustling modern cities. For most of its history Germany has been divided into small states, and in earlier times, into tribal territories. The Roman invaders never succeeded in entirely subduing the Frankish tribes, and after the Holy Roman Empire the country split into a multitude of small states. The Napoleonic invasion was the start of the unification of Germany, and in 1871 Prussia led the formation of the German Empire. The end of the First World War saw the abdication of the Kaiser, and a short-lived republic. The economic woes of the country in the 1920s led to considerable unrest and the rise of the Nazi Party under Adolf Hitler. At the end of the Second World War the country was divided into four sectors under British, American, French and Soviet Russian control. The division between West Germany and East Germany remained until the historic fall of the Berlin Wall, and the reunification of Germany took place in 1990. The country is now the most prosperous in Europe, with thriving high tech, aerospace, and financial industries. One of the best ways to see the country and enjoy what it has to offer the tourist is to arrange car rental through GoCarRental.com ahead of a trip to Germany, to give you the freedom to explore. You may need to decide what the theme of your trip is going to be in case you find yourself overwhelmed by choices – for many people, an unmissable experience is a tour of the castles on the Rhine, with the Middle Rhine being richest in clifftop citadels. Between Wiesbaden and Coblenz there are over 20 historic castles to visit, and the ever-changing vistas of the Rhine River to delight the tourist. 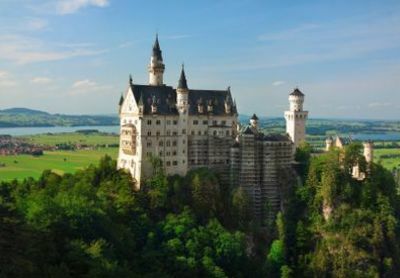 Further south, Neuschwanstein Castle built by “Mad King Ludwig” is the stereotypic fairytale castle, with its spires and dramatic situation perched on a mountain crag. Of German cities, Cologne is one of the most fascinating, with its world-famous Gothic cathedral, twelve Romanesque churches and historic quarters. Berlin, the capital of reunified Germany, is a must on any list of places to see, offering the visitor cultural sights and some of the best galleries and museums in Europe, as well as a reminder of the city’s recent past in what remains of the Berlin Wall. The Black Forest has the largest nature reserve in Germany, and a wonderful mix of meadows, farmland and forest. The medieval cities and cultural centres of Freiburg and Baden-Baden are located in the area. The Lake Constance region, where Germany borders Switzerland and Austria, is a paradise for vacation-makers, with watersports, hiking and adventure sports, historic monasteries to explore, and open air museums of pre-history. Driving in Germany can be a real pleasure, as long as you familiarise yourself with the traffic regulations before your trip. The roads and motorways are well signed and maintained, and there is an excellent network of motorways. Although German drivers can drive fast on un-speed limited autobahns, they are generally very law-abiding. Some key points to remember and check when collecting your car rental : all cars must be fitted with winter tyres during winter weather conditions, and you should be provided with chains if you are planning to drive above the snow line in winter. When driving on autobahn or dual carriageways you should always overtake on the left and return to your own lane as soon as possible – hogging the middle lane is illegal in Germany! There are also penalties for tailgating and speed restrictions are rigorously enforced. The alcohol limit (worth knowing if you are planning a good lunch) is 0.05%, equivalent to a small glass of beer.